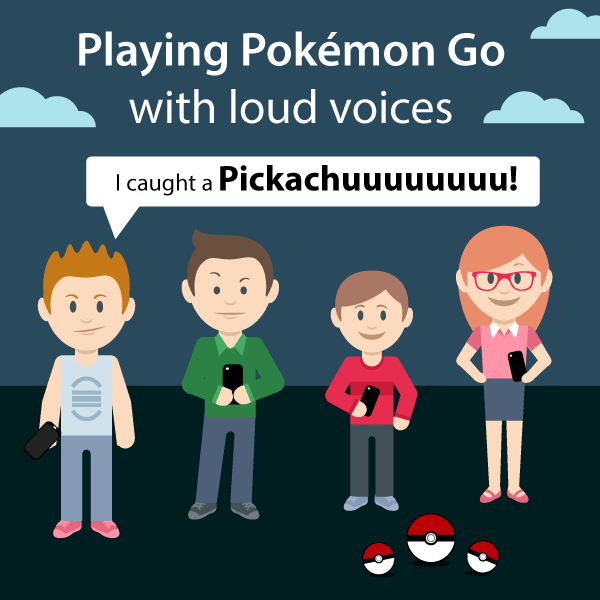 Beware Pokemon Go, players! Top 5 offences Malaysians may commit when playing. 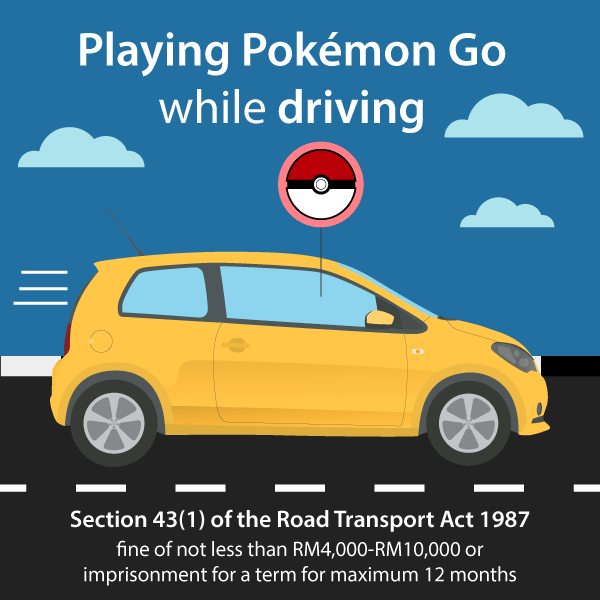 Do you know that you can get into trouble with the Malaysian law by playing Pokemon Go on your mobile phone? 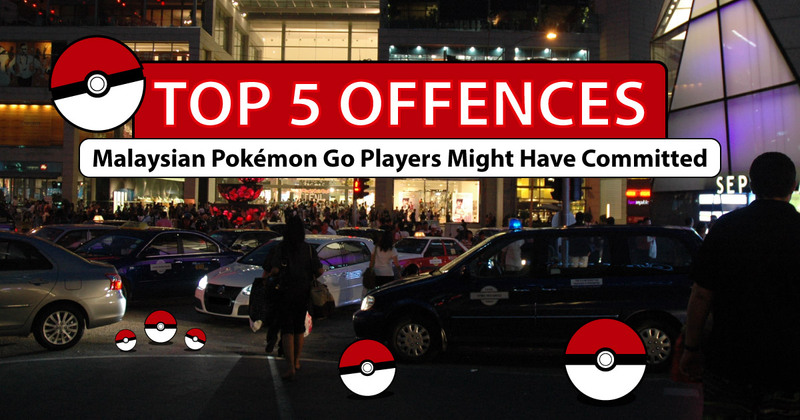 It may seem like a harmless game but here are the top 5 offences you may not be aware of while playing. 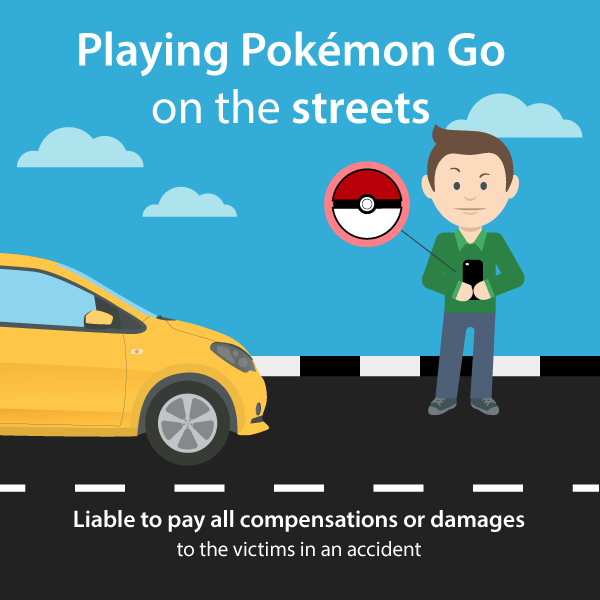 If you play Pokemon Go behind the wheels, BE PREPARED to be slapped with a road transport summons. 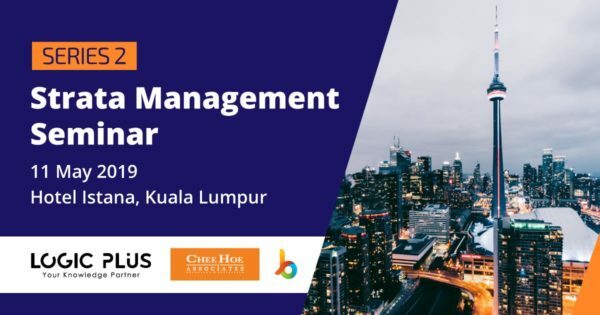 You can be charged in the traffic court under Section 43(1) of the Road Transport Act 1987 and be convicted with a fine of not less than RM4k-RM10k or imprisonment for a term for maximum 12 months. 1) A person who drives a motor vehicle on a road without due care and attention or without reasonable consideration for other persons using the road shall be guilty of an offence and shall on conviction be punished with a fine of not less than four thousand ringgit and not more than ten thousand ringgit and shall also be liable to imprisonment for a term not exceeding twelve months. Watch where you’re going! Before you can finish reading this sentence, you may have walked into a busy street and caused a 5 car pile-up accident! Do you think you are not at fault? Think again. You may be liable for negligence by causing an accident. The court may apportion liability to you even to the extent of 100% and you will be liable to pay all compensation or damages to the victims. 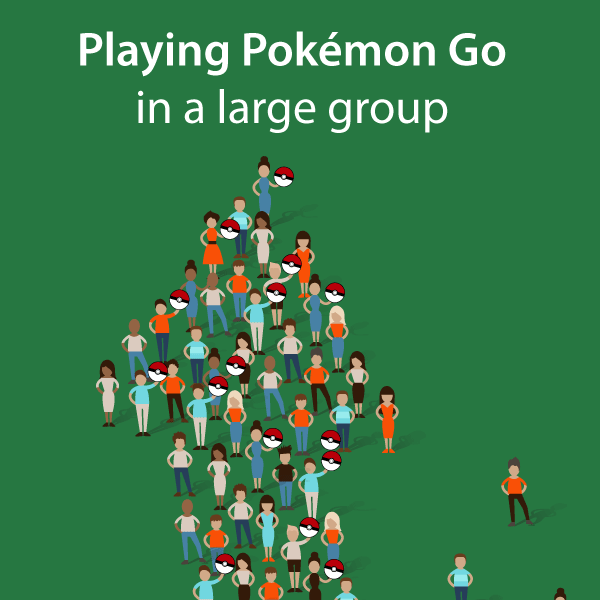 Try playing with several Pokemon players. You all giggle your way through the night and have a good time right? Fair warning you will likely get pots and pans thrown at you from all floors of the apartment complex. So do we mean you can’t giggle? Oh no, you can, but not when it causes nuisance or interferes with a person’s quiet enjoyment of his property or land. “Do not enter or you will be prosecuted”. This billboard comes often and it is very real if you step into a land without any permission granted to you. 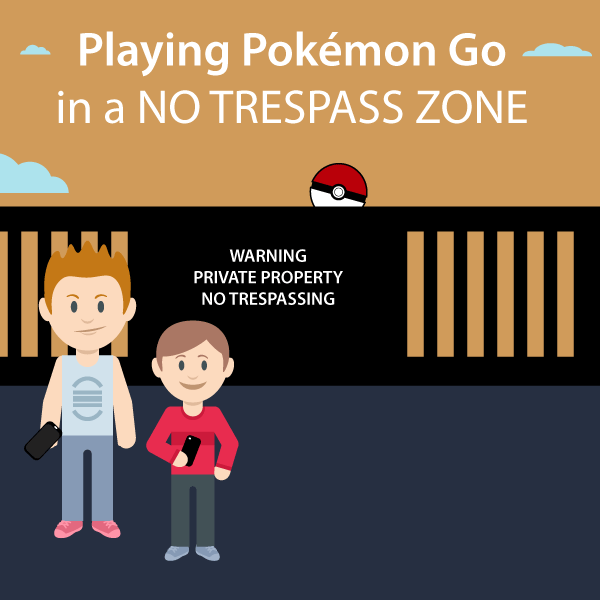 Just imagine trying to hit the pokemon with the ball when you are equally hunted down by the landowner. The definition is a wide one and for your benefit, we extract them below. Every unlawful entry by one person on land in the possession of another is a trespass for which an action lies, although no actual damage is done. A person trespasses upon land if he wrongfully sets foot on, or rides or drives over it, or takes possession of it, or expels the person in possession, or pulls down or destroys anything permanently fixed to it, or wrongfully takes minerals from it, or places or fixes anything on it or in it, or, it seems, if he erects or suffers to continue on his own land anything which invades the airspace of another, or if he discharges water from another’s land, or sends filth or any injurious substance which has been collected by him on his own land on to another’s land. You must be wondering, why are we drawing an analogy for Pokemon players using Bersih or red shirt supporters? We’re not, actually. As long as there are more than 5 players congregating in an area with the objective to conduct mischief, you may commit an offence under Section 143 of the Penal Code punishable with imprisonment for a term which may extend to six months or with fine or with both. Section 141 Penal Code provides the grounds on when an assembly is an unlawful one. (e) by means of criminal force, or show of criminal force, to compel any person to do what he is not legally bound to do, or to omit to do what he is legally entitled to do.